Once-exotic forms of Muslim women's head and body garments have now become both familiar in the West and the source of fractious political and legal disputes. The hijab (a hair-covering) is ever-more popular in Detroit but has been banned from French public schools, discouraged by the International Football Association Board, and excluded from a court in the U.S. state of Georgia. The jilbab (a garment that leaves only the face and hands exposed) was, in a case partly argued by Tony Blair's wife, first allowed, then forbidden in an English school. 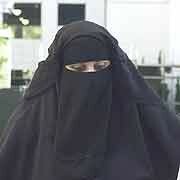 Sultaana Freeman wanted her Florida drivers license to show her in a niqab, but an Orlando court said no. The niqab (a total covering except for the eyes) became a hot topic when Jack Straw, a British Labour politician, wrote that he "felt uncomfortable" talking to women wearing it. If Quebec election authorities disallow the niqab from voting booths and a judge disallowed it from a Florida driver's license, it is permitted in British courts and a Dutch candidate for municipal office wore one. A British hospital even invented a niqab patients' gown. The burqa (a total head and body covering) has been barred from classrooms in the UK, is illegal in public places in five Belgian towns, and the Dutch legislature has attempted to ban it altogether. Italy's "Charter of Values, Citizenship and Immigration" calls face coverings not acceptable. A courtroom in the United States has expelled a burqa'ed woman. In brief, no general rules govern Islamic headwear in the West. Some observers would ban hijabs from public places, but what legal grounds exist for doing so? Following my rule of thumb that Muslims enjoy the same rights and obligations as other citizens, but not special rights or obligations, a woman's freedom of expression grants her the option to wear a hijab. In contrast, burqas and niqabs should be banned in all public spaces because they present a security risk. Anyone might lurk under those shrouds – female or male, Muslim or non-Muslim, decent citizen, fugitive, or criminal – with who knows what evil purposes. Some examples (full details can be found at my weblog entry, "The Niqab and Burqa as Security Threats"): A spectacular act of would-be escape took place in early July, when Maulana Mohammad Abdul Aziz Ghazi, 46, tried to flee the Red Mosque complex in Islamabad, Pakistan, where he had helped lead an insurrection aiming to topple the government. He donned a black burqa and high heels but, unfortunately for him, his height, demeanor, and pot belly gave him away, leading to his arrest. One of the July 2005 London bombers, Yassin Omar, 26, took on the burqa twice – once when fleeing the scene of the crime, then a day later, when fleeing London for the Midlands. Other male burqa'ed fugitives include a Somali murder suspect in the United Kingdom, Palestinian killers fleeing Israeli justice, a member of the Taliban fleeing NATO forces in Afghanistan, and the murderer of a Sunni Islamist in Pakistan. Burqas and niqabs also facilitate non-political criminal behavior. Unsurprisingly, favorite targets of robberies include jewelry stores (examples come from Canada, Great Britain, and India) and banks (Great Britain, Bosnia, and two 2007 attacks in Philadelphia). Curiously, in Kenya, street prostitutes have donned buibuis (which reveals slightly more of the face than a niqab), the better to blend into the night population and avoid the police. Expressing the universal fear aroused by these garments, a recent Pakistani horror film, Zibahkhana (meaning "slaughterhouse" in Urdu) includes a sadistic cannibalistic killer figure dubbed "Burqa Man." The practice of covering the face derives from tribal customs that build on Islamic law, not the law itself. For example, some tribeswomen in Saudi Arabia's Al-Kharj region put on the burqa at puberty, then never take it off – not for other women, not for their husbands, and not for their children. These family members typically see the woman's face only when viewing her corpse. British research offers another reason to drop the burqa and niqab, finding that covered women and their breast-fed children lack sufficient amounts of vitamin D (which the skin absorbs from sunlight) and are at serious risk of rickets. Nothing in Islam requires turning females into shapeless, faceless zombies; good sense calls for modesty itself to be modest. The time has come everywhere to ban from public places these hideous, unhealthy, socially divisive, terrorist-enabling, and criminal-friendly garments. Aug. 1, 2007 addendum: The above article appeals for the ban of burqas and niqabs; at "The Burqa Wars" I document efforts, some successful, to do just this.